Several years ago I was enjoying a long weekend in Tuscany. It was the stuff my dreams are made of. Long hot days. Inspiring architecture. Fantastic food. It was a colourful and enriching experience. At the same time, I was alone. Yes, it was a solo trip, a little something to treat myself after many months of very hard work. But I was also going through a very difficult stage in my life and was feeling really abandoned by the world. On this particular day – a very sunny Sunday – I was heading to Siena’s Duomo, when I walked off the famous elliptical square into a side street and found myself at the preparations for a party. Two long lines of wooden tables curved down the street. Dozens of chairs stood ready in anticipation for the many guests to arrive. Blue and white flags livened the scene and the fish-shaped lights gave it just a touch of extravagance. It was a joyous scene. So Italian. A party! Everyone is invited. I felt like I slowly started reconnecting with the world. Once more I wanted to be an active part of it and my creative juices started flowing again. A couple of days later I flew back to London, where life resumed its everyday grind. My particularly bad stage slowly lifted its dark clouds and time brought me new experiences and new challenges to contend with. 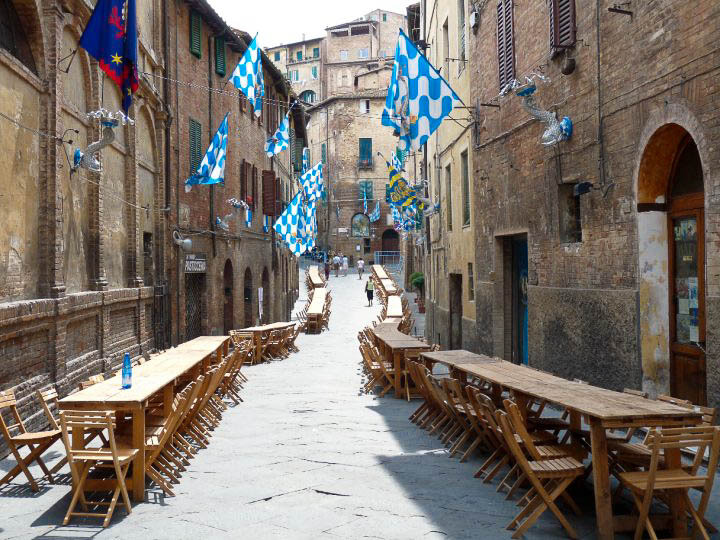 In my mind’s eye I would sometimes revisit that side street in Siena and wonder who and what the party had been for. I never found out, but the scene with the wooden tables and chairs, with the blue and white flags and lights came to represent the perfect party setting for me. A natural spontaneous environment where people can sing and dance, and clap to the music and eat, and be convivial and simply enjoy a happy moment in time. Then, after much talking about it and spending five years intending to do it, over three months in 2014 my husband and I packed our belongings, rented a flat in Vicenza and left England to live our Italian dolce vita dream. Obviously, the more time I spent in Italy, the more I learned about it – its customs, its history, its good and not so good sides. At the same time, many long forgotten memories started to resurface in my mind. To my surprise, I realised that I had a lot of references to Italy in my childhood and my teenage years – from the books I had been reading to the music I had been listening to at the time. Little anecdotes started popping on the surface and for the first time ever I was able to connect the dots between a person – an author, an artist, a musician – and the actual Italian place where they had been born and how it must have influenced their creativity. Italy has this uncanny ability to bring you immeasurably closer to people and events which have shaped our world. It is a land of explorers and discoverers, mathematicians and musicians, poets, painters and fashion shapers. So, I decided to get them all together. Well, may be not all, but the ones who have had the biggest influence on me. The ones I can tell you little personal stories about and whose art, craft and discoveries move me to this day. Some of them are long past and some of them play a major role in our contemporary world. Some of them have inspired me since my childhood and others are brand new discoveries. Some are people of the arts and some are people of the sciences. So, don’t try to find a method applied to their selection. It is personal! If I have a way I would have them all with me at one perfect party in that side street in Siena with the blue and white flags and the fish-shaped lights. Just imagine the conversations which would be had, the stream of creative dialogue, the amount of raucous partying. I remember reading this book as a child. It was very big with hundreds of pages and I had found it in the bookcase at home. It was by Irving Stone and it was called ‘The Agony and the Ecstasy’ – a biography of the greatest sculptor and painter who has ever lived – Michelangelo. I poured over the pages, skipping the ones with long passages about the politics of the time, and loving the ones about his time at Ghirlandaio’s studio and his friendship with Contessina de Medici. I inhaled the descriptions of Florence. And to this day I remember little details like the way they would transfer a fresco from the cartoons onto the actual wall and the advice given to the young Michelangelo how to use the yolk of a countryside hen to achieve a warmer hue in his paintings. This book created a yearning in me to see Michelangelo’s works and to this day I admire him as my most favourite painter and sculptor of all times. Seeing David in L’Accademia in Florence a few years ago was like a moment of pure love. And seeing, also there, the large marble blocks with half carved figures out of them, gave me a visual understanding of the physical endurance and great vision this man had in order to be able to release his living and breathing works of art from the cold marble stone. There is something so ethereally beautiful in the faces painted by Botticelli. Would it be because he was inspired by his feelings for Simonetta Vespucci that he painted pure love? Seeing his ‘Venus’ and ‘Primavera’ in the Uffizi Gallery is one of my personal highlights. The crowds were huge and suffocating, but I found that if I sat on the bench right in front of each painting and patiently waited, there were seconds-long pauses between the departure and arrival of each throng, so I could catch a full unobstructed view and enjoy each and every little detail. Did you know that the grass on which the naked feet of the nymphs and the goddess Flora are stepping on in ‘Primavera’ is flecked with 190 different types of flowers?! It is the joy of discovery of details like this one which makes seeing Botticelli’s paintings such a multilayered event. I think most people (especially parents) have heard of the Montessori education method. Did you know though that it was developed by an Italian lady called Maria Montessori?! I didn’t, until I actually moved to Italy and started looking into local nurseries. Being a mother myself, the Montessori method, and especially the accent it puts on practical play and developing the child’s own initiative, sounds great to me. Plus, I have heard lots of positive things about it from fellow parents. In fact, the only negative things I have heard about it, is the size of the fees for the Montessori nurseries and schools in the UK. I know of several people who simply couldn’t afford them and had to pull their children out and enroll them in local schools to the child’s and the parents’ eternal regret. So, I would love to know Maria’s opinion on this and how her method can be made more accessible especially in times of financial crunch. I am such a big fan of Signore Pigafetta, it seems strange I only found out about him and his achievements about a year or so ago. As luck would have it, he is one of the most illustrious sons of our current hometown of Vicenza and his house is one of the most beautiful buildings in the city. I call him the ‘First Travel Blogger’, as he is the diarist who accompanied Magellan’s on his historical first voyage round the world and described in minute detail the circumnavigation, the many discoveries made during the three years and one month it took and even the death by a poisoned arrow of Magellan’s himself. Pigafetta was also one of only 18 people to complete the circumnavigation out of the 240-strong crew which had originally set sail. If you want to learn more about him, please, click here, as last year I wrote a special blog post about this illustrious man. I just want to tell you that on days when I am feeling a bit down, I always remember the sign carved in stone on the walls of Pigafetta’s house in Vicenza. In French it says: ‘There is no rose without a spine’. An eternal reminder that behind every heroic achievement there is a lot of hard work. My childhood would not have been the same without the books of Gianni Rodari. I loved his stories! Have you read the one about a huge cake appearing one day in the sky?! Initially people think that the Martians have come to attack them, but as the days pass and nothing happens, eventually they go to explore the strange object, only to find out that it is the most wonderful and tasty cake. The whole town then gets together and starts to eat. Oh, the descriptions of the mounts of cream and the rivers of marzipan and the lake of chocolate and how children and adults ate through it all were so wonderful to read. Gianni Rodari’s stories sparked my imagination and to this day I remember the characters created by him like Don Tomato, Prince Lemon and the Little Onion. It would be such an amazing thing for me to be able to say thank you to the writer himself for building on the pages of his books this wonderful world where I would spend many happy hours with my imagination alight. Even if you haven’t heard the name of Ennio Morricone, I am sure you are not only able to recognise his music outright, but also at least one of his pieces forms part of the soundtrack of your life. His music grabs you by the throat, it paints pictures in front of your stunned eyes and it is so memorable, people often catch themselves humming along as soon as one of his tunes comes up on the radio or on the TV screen. The title piece of the ‘The Good, the Bad and the Ugly’ is my all-time favourite. I only discovered the paintings of Giovanni Bellini during my not so successful visit to Gallerie dell’Accademia in Venice earlier this year. I was walking through the huge cold rooms of the world-renowned gallery, feeling underwhelmed by its higgledy-piggledyness and smudged light, when, all of a sudden, this huge angel came out of the wall at me and stopped me in my tracks. His red hair, his black wings, the stem of white lilies he was holding… It was all so full of impact. I loved the drapes of his long flowing dress with beautifully painted light reflected off the heavy fabric. Bellini’s paintings really spoke to me and made an otherwise lack-lustre hour spent in Accademia worthwhile. If Florence had the Medici and Rome had the Borgias, Verona had the Scaliger Family – a dynasty which at one point had stretched its rule far beyond the reaches of modern-day Veneto. The Scaliger were powerful, they were warriors and they were also patrons of the arts. You will find their castles everywhere – from the picturesque villages of Sirmione and Malcesine on Lake Garda to Verona where their splendid old castle Castelvecchio nowadays houses a big art museum (incidentally, this is where 17 invaluable paintings by the likes of Rubens, Tintoretto and Pisanello were stollen from earlier this month). The Scaliger would be frightening yet compelling guests with a lot of stories to tell – from their conquests to their patronage of Dante, Petrarch and Giotto. As a linguist, I am always attracted to people who have mastered several languages and Elena spoke seven (having learnt Latin and Greek by the tender age of seven!). She then went to acquire Hebrew, Spanish, French and Arabic. Born in Venice in 1646 to a peasant mother and a father with a high-ranking post, this amazing lady also became the first woman to receive a University doctoral degree. Apart from languages, she also excelled at mathematics and astronomy and was particularly interested in philosophy and theology. In an age when the place of women was firmly at home, it is incredible how much Elena achieved. Consider this – when she applied for a Theology Doctorate degree, her application was refused by the Church as it was considered inappropriate for a woman to be a Doctor of Theology. Instead and only after applying for a second time, she was given permission to study for a Doctor of Philosophy. Elena was also a skillful musician and composer. She refused to marry and dedicated her life to learning and charity. What an amazing lady! He has the most incredible name (in Ancient Greek ‘Eros’ means ‘love’! ), a voice which touches your heart and his handsome looks made him very popular indeed among my teenage friends as I was growing up. For some reason Italian music is very much admired in Bulgaria (where I come from), so I grew up on a diet of Adriano Celentano, Toto Cutugno, Zucchero and Al Bano and Romina Power. As it happens, Eros Ramazzoti was the one most lusted after out of the lot. And when he released ‘Cose della Vita‘ in 1993, we simply couldn’t get enough of him. When we moved to Italy last year, one of the first things I spotted around Vicenza were large posters advertising his latest tour. It seems somehow he had turned 52. I couldn’t quite believe it, as in my mind he will always be that very attractive, very soulful young man singing in that really heartbreaking voice ‘Sto pensando a te‘. Who wouldn’t want to have Christopher Columbus as a guest?! The man who expanded our notion of the world. The man who sailed straight ahead in uncharted waters at a time when most people thought that upon reaching the end of the flat as a pancake Earth, his vessels would tumble down and fall through into a terrible infinite abyss. I admire people with the go-getting attitude exhibited by him. Turned down by the kings of Portugal and England, by the city-states of Genoa and Venice and initially by the Catholic Kings of Spain (who would later finance his journeys of discovery), he never stopped looking for ways to turn into reality his crazy idea of reaching Asia by sailing westwards. I think there is a lot to be learnt from him in terms of being persistent and one of my most cherished memories is visiting his (reconstructed) childhood house in Genoa. I admire strong, creative women who have the guts to leave a mark on this world and Veronica Franco was all this and then some. She was a Venetian, a poet and a courtesan and spoke of the value and abilities of women in a time when, generally speaking, they were safely tucked away at home and only expected to keep a tidy house and bear child after child. She was married off to a doctor in her teenage years, but she separated from him and even asked for her dowry to be given back to her. She became the most acclaimed courtesan in Venice and supported herself and her large family. She wrote poesy and compiled anthologies. She engaged in literary discussions and used her poems to defend herself and women who are abused by male attackers. She had a full and dramatic life. I remember watching the film ‘Dangerous Beauty’ about her and loved the scene where, dressed in colourful, revealing clothes, she meets the respectable Venetian wives, all dressed in grey dark tones. It was a very provocative scene, highlighting the contrast between them and their status in life and illustrating how restricted women were in their choices in life and how dangerous it was to take a step away from a very rigid expectation as to what you could and couldn’t do. Just over a year ago, we took a day trip to Arqua Petrarca – a charming stone village in the Euganean Hills in Northern Italy. In this secluded place, the distinguished poet and humanist Petrarch spent the last five years of his life. We visited his house there and the thing which really made an impression on me was the fact, mentioned offhandedly in the informational posters dotted around, that (1) no-one knows for sure who Laura – his one pure unrequited love and inspiration for his poetry – was and (2) nothing is known of the two women who bore him a son and a daughter. In contrast, the names of his many male friends and various benefactors are well preserved. I had this burning desire to find out more about these three women who had given the two most important things to a man – inspiration and children – and whose names and personalities had been completely obliterated from history. I hope I am not shocking you too much, but my only interest in having Petrarch as a guest to my Italian dream party is to find out more about them. In my childhood dreams I aspired to be a journalist. Not any kind of journalist, mind you, but the one who travels to the hot spots of the world to write about suffering and war, the one who uncovers the great stories of our time and the one who is not afraid to lift the lid of the contemporary melting pot and with an objective eye to spot the new trends and the inevitable truths. Even though I did work as a journalist for some time, for many reasons I never achieved such heights. But there is one lady who did. Her name is Ornela Fallaci and even though she is not with us anymore her writings and her interviews still speak loud. It would be such an incredible honour for me to have Ms Fallaci as a guest and to hear her speak about this world and what we are doing with it. No party would be complete without a good villain and Salieri is just the right man for the job. It is certainly down to popular culture (‘Amadeus’ anyone?!) that he is mostly remembered for his apparent deep jealousy of Mozart’s creative genius which led to the alleged poisoning of the young composer. At the same time, Salieri was a prolific composer himself and enjoyed royal acclaim and important positions within the court of the Habsburg monarchy. So, it would be quite interesting to hear his own version of the events and find out once and for all where he personally stood in regards to Mozart and was he really the green-eyed monster personified as we like to think of him today. Exactly five years ago I was in Vienna for a few days and remember spending a feverish hour in the Kunsthistorisches Museum there walking from room to room trying to find the paintings this venerable art institution has of Arcimboldo. You know the artist who painted faces composed of everyday objects like vegetables, flowers and fruit?! Well, this is Giuseppe Arcimboldo – a 16th century native of Milan who became a royal court painter and costume designer. His amazing portraits fascinate us still today as he skillfully painted sea creatures, roots, branches, leaves and an amazing array of vegetables and fruit to build up on the canvass a human head. Unfortunately, I didn’t see his original work in Vienna on that day five years ago, as it transpired that his paintings had been given on loan to an US museum, which name now escapes me. I had to resign myself to buying a simple postcard with the image of Summer – one of his most famous works. It would be such a compelling thing to find out how and why Arcimboldo started painting these still very modern in their composite approach portraits, especially at a time when every respectable artist would explore almost exclusively religious themes in his paintings. I never loved maths at school. I wouldn’t go as far as to say that I hated it, but, yeah, OK, maybe I did. I couldn’t understand the need of it at a time when my mind was mainly interested in music, literature and learning languages. Nowadays, I am slightly wiser and see how far-reaching of an impact mathematics has on our daily lives. Even when I took a DJ course some years back, I realised how a mathematical approach to mixing was quite useful as counting the beats was helping me drop the next track just at the right moment. So, women who have dedicated their lives to mathematics hold a certain fascination for me. It interests me how their brain operates on a completely different level than mine and how they find a long line of numbers a compelling enough reason to get out of bed each day. Maria Gaetana Agnesi (1718-1799) was one such woman, what with being the first woman to write a mathematics handbook and the first woman to become a University Professor of Mathematics. She was also a theologian and set up a hospital in her home to help the poor. The year was 1995 and the soft tune of ‘Children’ had us all in trance. Composed by a DJ with an Anglo-Saxon name, it was quite the surprise when I found out that he was in fact an Italian called Roberto Concina (this was pre-Google and the internet, so you would read such things in music magazines or find them out from your favourite radio DJ’s). ‘Fable’ and ‘Freedom’ followed and I couldn’t get enough. Apparently Robert Miles composed ‘Children’ as a chill-out track, something for Italian DJ’s to play at the end of their sessions to relax the audience. He had read that young Italian people driving back home after a night out would take unnecessary risks by speeding up still under the influence of the fast-paced music they would listen to in clubs. So, he wanted to create a track which would calm them and make their driving a bit more conscious. It would be such a great thing to have Robert Miles at my Italian dream party and find out what he is up to nowadays. And if he spins a track or two, I will be the first one on the dancefloor. Chocolate and fashion! It sounds heavenly. And, even though nowadays fashion would rarely fit you if you indulge in chocolate, there was one woman who knew the way to paradise and she not only established a fashion house under her name, but also created one of the biggest chocolate brands in Italy – Perugina – still going strong today. Step forward Luisa Spagnoli who started a chocolate shop in 1907 in her hometown of Perugia which nowadays is a huge brand and produces some of my most favourite chocolates ever, like the dreamy ‘Baci‘. After the First World War, Luisa was also the first person ever to start using angora yarn in garment manufacturing leading to the creation of Angora Spagnioli. So, yes, chocolate and fashion! Definitely something I am interested in. When I was growing up, Ornella Mutti was certainly the pin-up of my parents’ generation. With her beautiful eyes and wide smile which could easily dissolve into a moody, yet cute expression, this Italian actress was the epitome of visual perfection women were aspiring to. She is half Neapolitan, half Baltic German and you could certainly see the passion of the South and the restraint of the North in her beautifully sculpted face. I, actually, remember seeing just one of her films as a child, it was some sort of Italian comedy loosely based on Bonny and Clyde. Yet her name was everywhere when I was growing up, so it would be great to have Ornella Mutti as a guest at my Italian dream party. The legendary explorer, the first European ever to reach China. His travels took him from Italy to Central Asia where he spent 24 years! And upon his return he described to his amazed contemporaries such marvels as paper money and the burning of coal. He is also credited by some researchers with introducing Chinese noodles to Italy where they evolved to become what we now know as ‘pasta’. Obviously, Italians strenuously deny this allegation and point to documents illustrating the fact that ‘pasta’, ‘maccheroni’ and ‘vermicelli’ were all known and used before Marco Pollo’s time. There are many theories about the life and achievements of Marco Pollo, his most vehement critics even suggest that he never stepped foot in China as such. So, it would be great to have him as a guest and hear from himself the long narrative of his travels and what he actually saw and experienced during his life among the Mongol rulers. You may have never heard of Federico Faggin, but you have a lot to thank him for or your computer and all other computer-based devices you use on a daily basis do. Born in Vicenza (hip hip hooray for our current hometown! ), Mr Faggin designed the first commercial microprocessor and was the leading figure in the process of invention and design of several revolutionary technologies in the world of IT. He worked at Intel and co-founded Zilog – the first company exclusively dedicated to microprocessors. In the late 80’s he started asking himself if it is possible to build a conscious computer, so in 2011 he founded the Federico and Elvia Faggin Foundation for the scientific study of consciousness at US Universities and research institutes. My interest in Giacomo Puccini started with a book I read about his life. The descriptions of his beloved Lucca stayed with me for a long time. Unfortunately, when I eventually visited Lucca many years afterwards, I couldn’t quite feel the composer in this little Tuscan town. So, it was a bit of a disappointment, like a childhood dream which didn’t quite live up to its potential. Since then I have been yearning to have another go at recapturing the magic of Puccini. I hear his opera Turandot will be staged as part of the world-famous Verona Opera Festival in the summer of 2016. I am looking into getting tickets for the performance as I write this and if Puccini could attend my Italian dream party, I would definitely ask him what inspired him to compose operas about China and Japan. I have never played the violin (I made a half-hearted attempt to learn the piano) and I hated it when kids at my music school would scrape their tiny violins during the performances we would stage for parents and friends once in a while. Yet, I hold a strange fascination with violin music when it is played well, I mean, really well. It is the instrument which is so easy to abuse producing cat squeals instead of the pure genius music it is capable of. Antonio Stradivari is the man who knew all about violins. The master luthier from Cremona created the most perfect violins in terms of their music capabilities and appearance. Today between 450 and 512 of the Stradivarius violins survive and they regularly fetch prices in the millions. I had the pleasure to see some of his violins in Cremona’s Museum of the Violin this summer. They looked just as beautiful as they sound. It would be fascinating to have Antonio Stradivari as a guest at my Italian dream party, as then I could ask him about his amazingly good ear and how he was able to create the perfect instruments with the most beautiful pitch. Yet another mathematician I would like to invite to my Italian dream party. Do you think mathematicians know how to have fun?! In our mind people obsessed with numbers always appear to be a bit geeky. Still, I would love to have Leonardo Fibonacci as a guest. Mainly to make my husband so, so happy. When we started dating, my now husband would often go on a tangent talking about Signore Fibonacci and his number and once, when I asked him what he was thinking of (and hoping for a different answer), he said ‘the golden ration and Fibonacci’. I still laugh thinking of it today. Still, having Leonardo there with us in that side street in Siena would be great anyway. Did you know, for example, that he was the person who popularised the use of the Hindu-Arabic numeral system in Europe?! In other words, if today you write 1 instead of the Roman numeral I and 5 instead of V, you have Fibonacci to thank to. So, here they are. The first 25 of my 50 Italian dream party guests! Half of the people I would like to gather round those long tables on that side street in Siena and have one raucous great party of gossip, discovery and fun. What do you think? Would they get along? Would there be lots of new discoveries and/or revelations to come out of it? Which ones of them would complain about the noise and which would delve right through in it? Oh, it would be so amazing if it could happen, don’t you think? I will be publishing the second part of my list soon, so keep an eye on the blog or follow me on Facebook for updates. Ta!